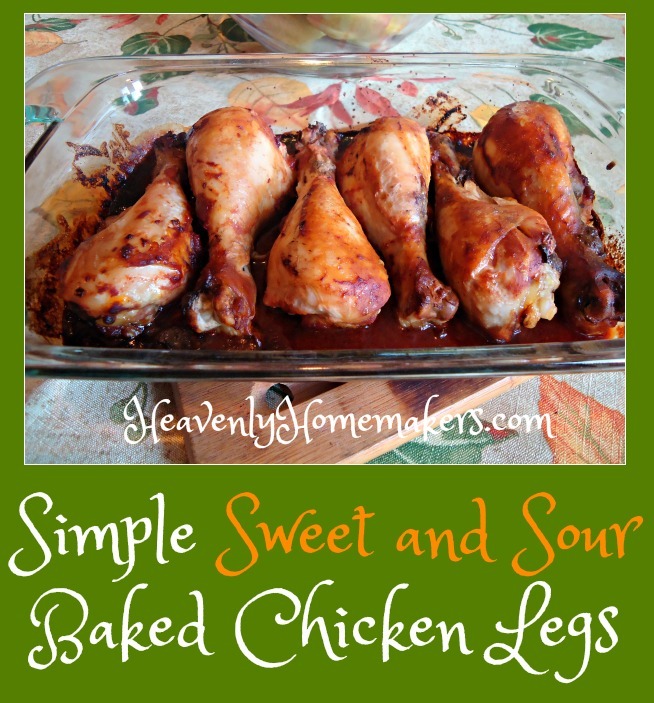 Everybody come get yourselves some Sweet and Sour Baked Chicken Legs. Plop some chicken in a dish. Mix up 5 ingredients to spread over chicken. Put the chicken in the oven and walk away. Just before dinnertime, throw frozen veggies in a pot to steam. If you don’t have a cow bell, I guess you can still make this chicken. Ringing the cow bell (to alert the men in the field that dinner was ready) was one of my favorite things to do at Grandma’s house. I’ve decided that I need one for my house. My men aren’t out in the field, but they are often wearing headphones. Perhaps they could hear a cow bell better than they hear my sweet (but wimpy) voice calling them for dinner? 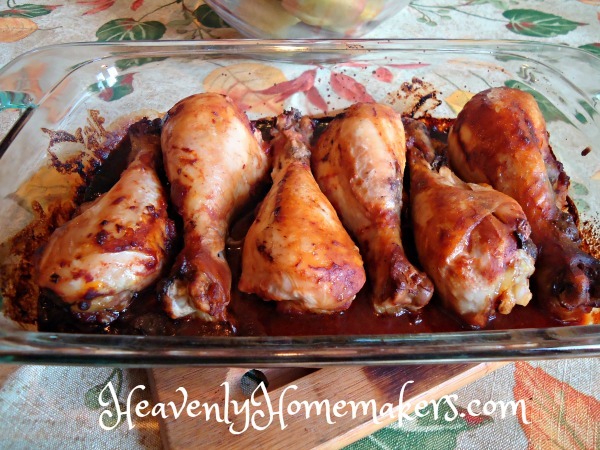 Lay chicken legs in a 9x13 inch baking dish. Mix honey, soy sauce, ketchup, and garlic in a small saucepan. Heat briefly to melt honey and to make sure ingredients are well combined. Spread mixture over chicken legs. Cover and bake in a 350 degree oven for 45 minutes. Turn chicken over in the sauce, cover, and cook for 15 minutes more. Be sure the soy sauce is gluten free if this is a need for you! You will love this simple main dish! Had to laugh at the cow bell. We have one too. However in our new house, sound does not carry as well. I got round to texting everybody ! I often throw out similar recipes, using whatever I find in the cupboards or fridge. Thank you for another great-sounding recipe! I used to get the Willow butter from Azure as well, and now I’m getting Rumiano Natural. The price is comparable (or was when I last checked), and it’s the most gorgeous yellow butter…. And Laura, I just love you for doing these Simple Meals recipes. :-) Thank you so much, and keep them coming! Our local grocery store carries a “better” brand of chicken that doesn’t have hormones or antibiotics and stuff (though truly I doubt it is raised tons better than regular chicken). I watch for it to be marked down and I stock up. I watch for their whole chickens, their chicken legs, and their boneless thighs. Butter? Ugh, the price keeps going up. So I’m settling for regular ol’ butter from the grocery store, hormones and all. For now, that’s what I have to do to keep my budget from blowing up. Feeding a houseful of teenage boys makes for an enormous grocery budget! Thanks, Laura and Heather, for the responses. I appreciate it. I LOVE these simple recipes, Laura! This one looks really good and I happen to have all the ingredients too. The other day I made your chicken soup with a kick that had only 4 ingredients and we really liked it. I added a little rice to make it go further but that was the only thing I changed. It tasted so good and was so easy! Thanks for the simple recipes, especially for sprucing up cheap chicken pieces that go on sale for such ridiculously low prices that we must find ways to cook them! I also had to laugh at the cow bell, because I’ve seriously considered getting one. YES, I have three men in the house, often with headphones, and on three different floors! I do need exercise, but not while my supper is over-cooking or getting cold waiting for me to run all over getting their attention. Quick tip: save all the leftover sweet and sour sauce in fridge (I added a little marsala wine I wanted to use up in the original recipe and used chicken thighs), reduce it to thicken when you next make chicken and brush on as glaze! I just did this on chicken breasts which I’m cooking atop a quick scalloped potato improv in a covered casserole dish — it’s looking and smelling good:)! To thicken the sauce, add 1/3 cup corn starch with the liquid before you pour chicken make sure to thicken the sauce in the pan before you pour or else you have too much liquid at the bottom.